Always when travelling it really gives you a flavor of the grandeur historical figures demanded. From this perspective we get a view into the mind’s eye of Roman Emperor Hadrian. This bridge, the Ponte Sant’Angelo spanned the Tiber river to reach his mausoleum. October 2013, single image, focal length 23mm, aperture f/11, shutter speed 151 seconds, ISO 50, ND 10-stop filter, tripod. Angels leading the way on both sides of the bridge. Here we see one angel holding a column and the other holding a whip. Each statue offers a level of intricacy worthy of its own photo and pedestal. Yet these are just small pieces of the elaborate path to the mausoleum. On top of the mausoleum rests the archangel Michael. As I mentioned in the last post, citizens thought an angel appeared on top of the mausoleum to indicate the end of the plague. The fantastic sunrise light had already begun to fade when I found this photo. Yet I managed to capture just the last rays of it here. The long exposure makes the strikes of clouds lead the eye to main subject of the castle. It really gave a dynamic feeling of motion in this scene. After a long morning shoot I was pleased with this collection of resulting photos. 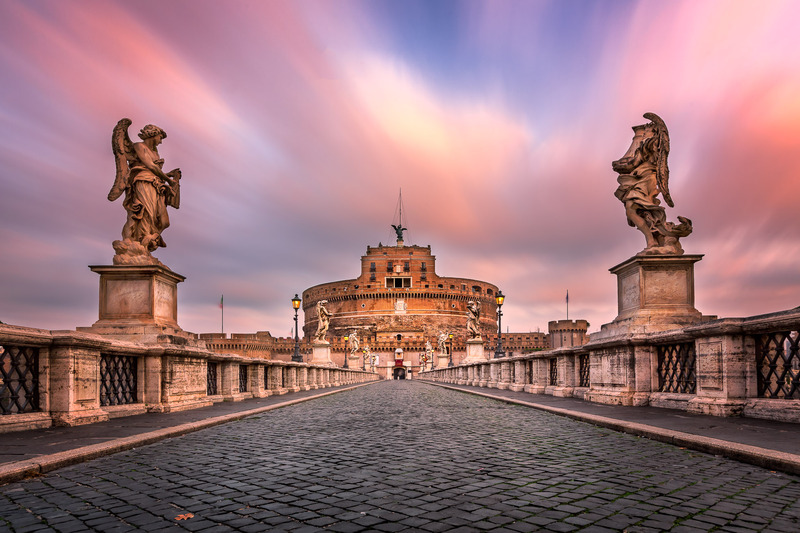 Magnificent sunrise and dramatic October clouds helped me to add a handful of great Rome photos into my portfolio.